This is the recipe you want in your back pocket for chilly, gloomy days or when you’re craving a healthier, comforting pick-me-up. It’s made with 8 simple (wholesome) ingredients in just 10 minutes. Let’s do this! 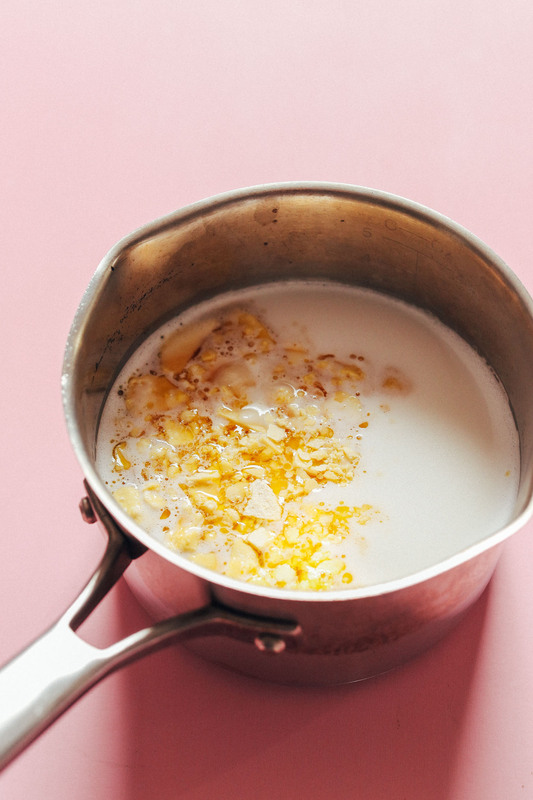 The base starts with creamy coconut milk, either DIY or light store-bought. If you’re not into coconut, you could also sub just about any other dairy-free milk, like rice or almond! Next comes cocoa butter, which adds not only richness but also that quintessential buttery chocolate flavor. Swoon! 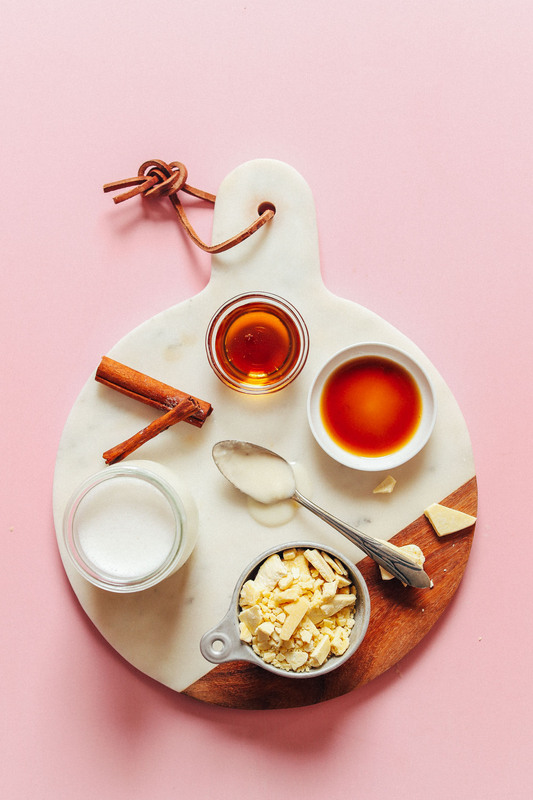 All that’s left is maple syrup for natural sweetness, vanilla and spices for flavor, sea salt for balance, and coconut butter for even more richness. Then serve and garnish! We topped it with our beloved coconut whipped cream, but it’s also delicious on its own. To make it boozy, add 1 ounce Kahlua or 1/2 ounce bourbon whiskey. This would make the perfect healthier pick-me-up when you’re craving something comforting. It’s like drinking a white chocolate bar while simultaneously getting a hug. Need we say more? 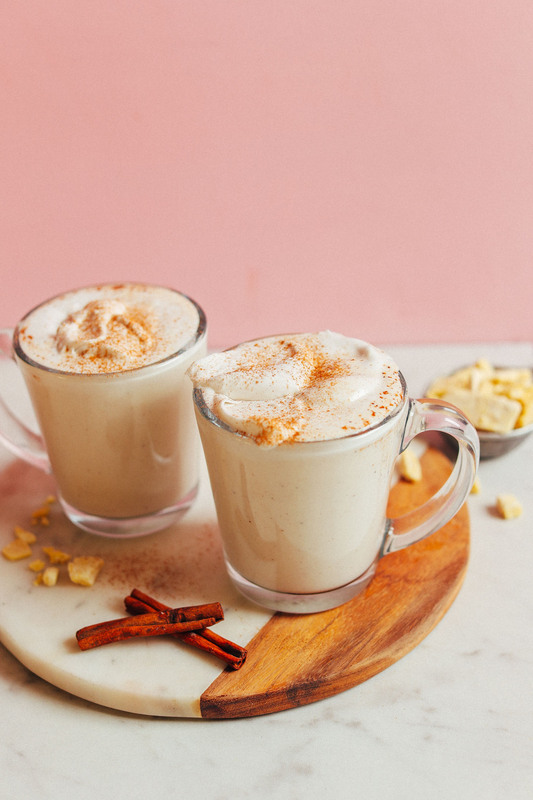 If you’re into cozy beverages, also be sure to check out our Feel Good Hot Chocolate, Rooibos Apple Cider Hot Toddy, Bourbon Chili Cinnamon Hot Toddy, 5-Minute Vegan Golden Milk, and Best Vegan Matcha Latte. 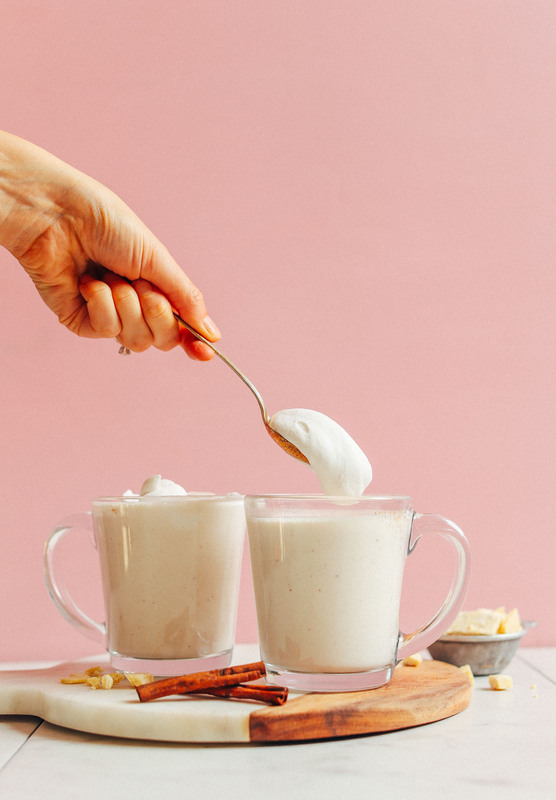 Creamy, dreamy, naturally sweetened vegan white hot chocolate! Made with simple, wholesome ingredients in just 10 minutes. The perfect pick-me-up or gloomy-day treat. To a small saucepan, add coconut milk and cocoa butter and bring to a simmer over medium heat. Reduce heat to low and simmer for a few minutes, whisking occasionally. Once melted and completely combined, remove from heat and add maple syrup, coconut butter, cinnamon, nutmeg, and sea salt. Optional: Add maca for a caramely flavor and hormone-balancing benefits. Taste and adjust flavor as needed, adding more maple syrup for sweetness, coconut butter for buttery coconut flavor, or cocoa butter for richer chocolate flavor (heat over stovetop as needed to melt). Add vanilla last and whisk to combine. 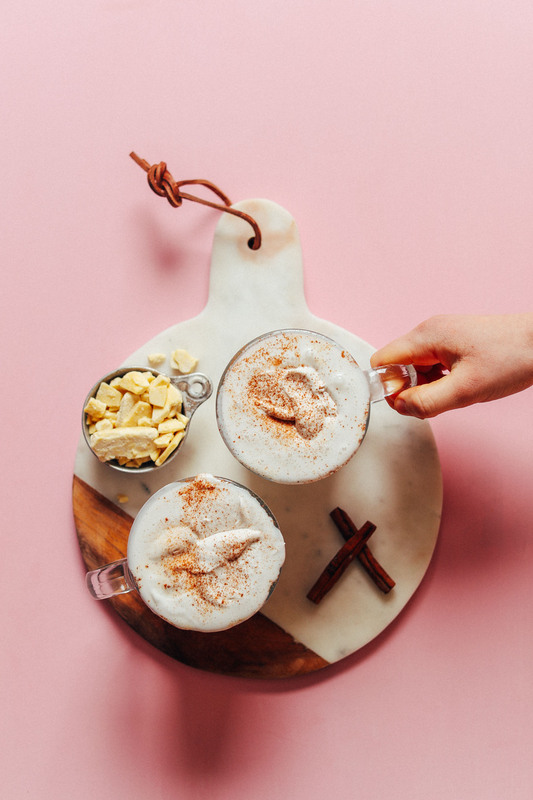 Divide between 2-3 serving glasses and top with desired garnishes, such as coconut whipped cream, cinnamon, and nutmeg. Best when fresh. Store leftovers in the refrigerator up to 5 days or in the freezer up to 1 month. *Nutrition information is a rough estimate based on 1/3 of the recipe calculated without optional ingredients. *To make it boozy, add 1 ounce Kahlua or 1/2 ounce bourbon whiskey (more or less to taste).